Travelling. You either love it or hate it, there is no in between. However, something that we can all agree on hating are airports. They are stressful, noisy, and frustrating places that attempt to take every last drop of our patience away from us. When you show up at an airport, you can expect to wait in long lines, get yelled at and patted down by security, and possible have your dreams of going to a luxurious vacation ruined if your flight gets cancelled. Unfortunately, if you want to get away from it all for a week away, airports are a necessary evil that we all have to face. If you’re anything like us, you cross your fingers every time you arrive at an airport in hopes that your flight won’t get delayed and you won’t have to sit in a middle seat next to a stinky passenger. One would think that there is no one that an airport experience could be improved, however, humor is a great way to pass the time and keep your spirits up. Although airports are often the cause of frustration and anger, they can also be the setting where families reunite after years of being away from each other. We have all seen those heartbreaking videos of soldiers returning home from deployment and hugging their children, sometimes for the first time ever. There have also been instances of proposals at airports, which leave fellow travellers walking by in tears. If you have been away from home for any extended length of time, you know the joy of seeing you loved standing at the arrivals gate and waiting with open arms and a smile on their face. Sometimes, after a long time away from each other, friends and family want to welcome their loved ones back in a unique and often hilarious way. 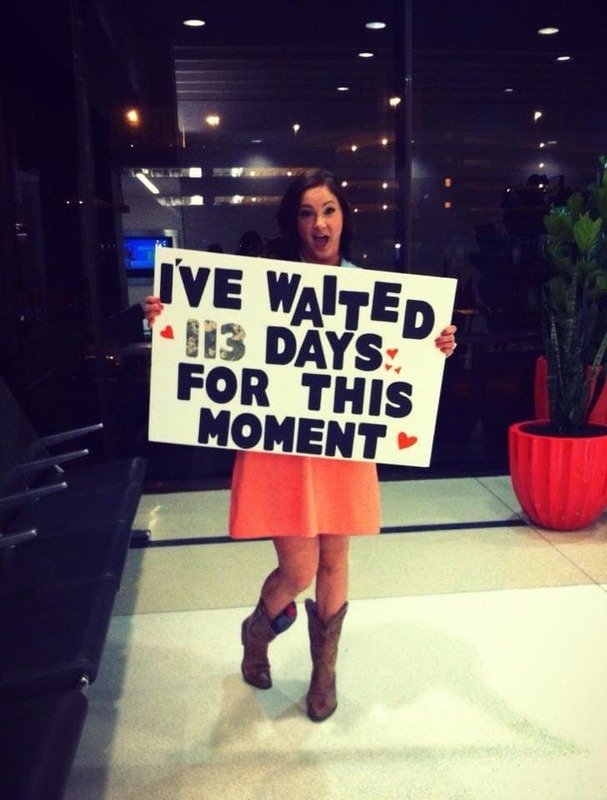 Have you ever seen those signs that drivers hold up at airports when their are waiting to pick up their passengers? Well, on occasion, people have been known for turning those signs into a moment of laughter (and sometimes embarrassment) for the people they are waiting to pick up. 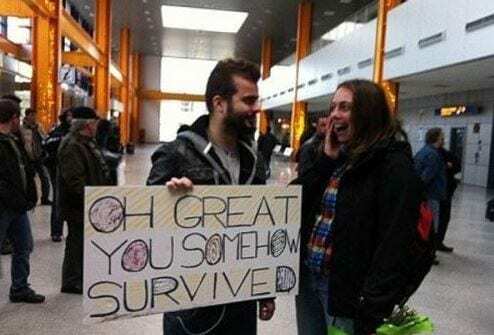 We have compiled a list of the best ever welcome home signs that people have created for their family and friends at the airport. Some of these will make your heart melt while others will leave you giggling all day long. Bon Voyage! Leaving your kids for a long time is hard for most parents, however, based on this picture, this mom might wish she had stayed on vacation for a little longer. Imagine walking up to your family and being greeted with a sign saying, “we are out of underwear and we don’t even have any on.” We would probably put our heads down and walk the other way. But we bet this mom wasn’t too upset and was probably happy just to see these little boys. Who said old people are boring? 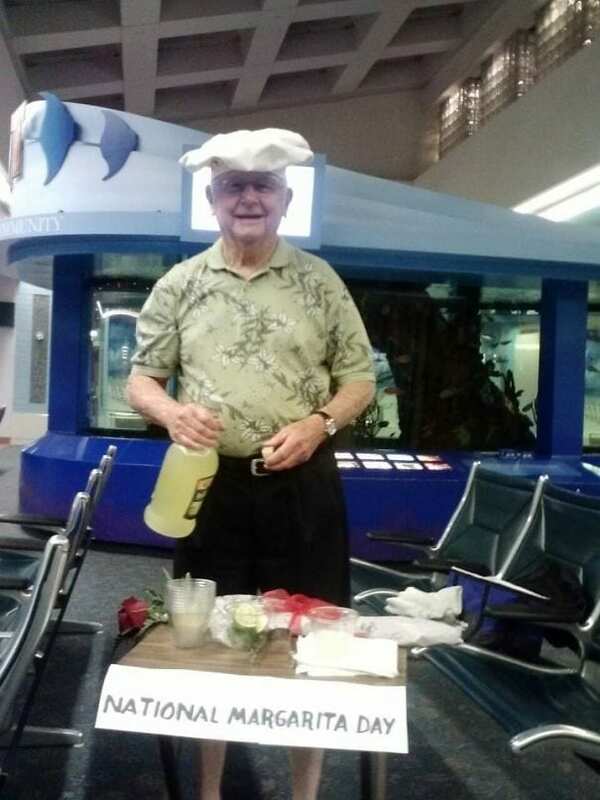 We’d love to show up to an airport and see this grandfather pouring margaritas for some disgruntled passengers. This guy knows how to celebrate a holiday! If this guy was waiting for his wife, we are sure that she would be very happy to see him. We suggest that people like this show up to airports around the country on the day before Thanksgiving when millions of unhappy travellers are heading back home for the holidays. 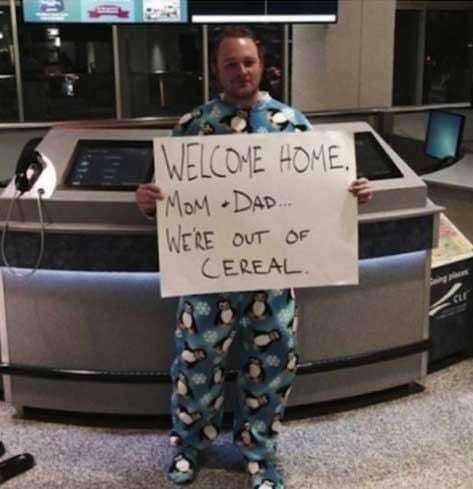 We want to know if these parents were embarrassed or happy to see their adult son in a onesie at the airport asking them to do his grocery shopping. Maybe what they say is true about kids getting too comfortable in their parent’s home. We suggest that this young man go to the counter, buy a ticket and go on a little journey abroad to find some independence. But in all seriousness, this guy is pretty hilarious and we bet his parents think so too. Friends fans rejoice! You gotta give this guy points for being creative and taking one of the most hilarious moments from the hit sitcom and applying it to real life. Who could forget when Phoebe and Mike both change their names to, well let’s just say some less than appropriate names. If you haven’t seen the show, you won’t get the reference but trust us, it’s funny. Whoever’s boyfriend this is, keep him and never let him go! Some things are better kept in secret. But not for this lady! She wants to get it all out in the open. We cannot even imagine the surprise on this guy’s face when he showed up to see this sign announcing where he was just returning from. This woman could have been a little more subtle with the giant block letters that almost anyone walking through that gate could see. At least he gets a hug according to the sign. We all know that dogs are man’s best friend but sometimes they do things that leave us questioning if this is really the case. But they are just so cute that we have to let a lot of things slide. We hope this dog owner wasn’t too angry when they came home only to see their comfy couch in tatters. But all could be forgiven if they were away from home for a while and just happy to be in the company of their loved ones and their puppies. We’ve heard of dad jokes but this is ridiculous. 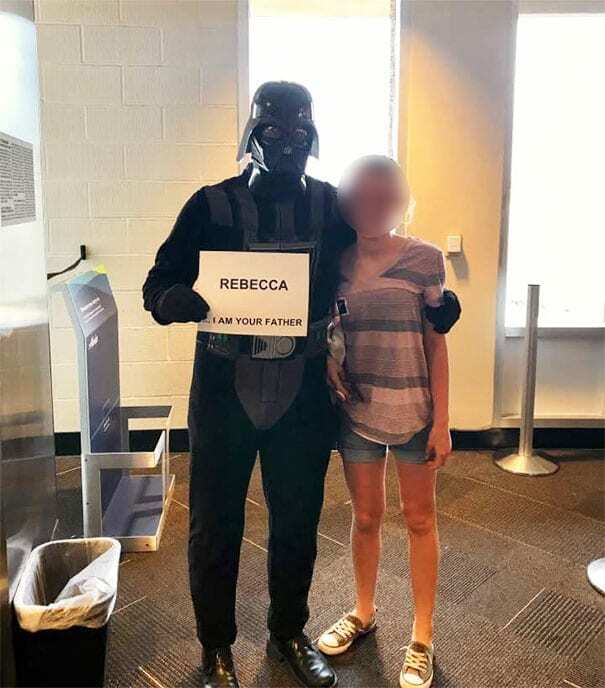 This Star Wars loving father clearly loves his daughter and went as far as embarrassing her in public. Just think of all the thought and planning that had to go into this oddly sweet gesture. We can only what the expression on that girl’s face is under the blurriness. Rebecca, you have a cool dad. Don’t forget that when he won’t let you go out on dates. We guess that these kids have done this before and their mom probably expects it by now. We wonder what other shenanigans they have gotten up to at home. We bet that this mother was thinking about what weird thing her kids were going to do the whole plane ride home. However, we (we) don’t completely understand why they said ‘we’ twice. Maybe they meant that only they would have very terrible grammar. At least she’s being honest. Maybe a little too honest as she is literally holding a sign asking this guy for money. We really hope that this is her actual father based on the apparent age difference between these two, however, we have a feeling that this pair are definitely not related. Whatever their relationship is, we really hope that this girl loves him for more than just his wallet. We can tell that this guy is one overprotective brother and he does not have any sympathy for the father of his future niece or nephew. 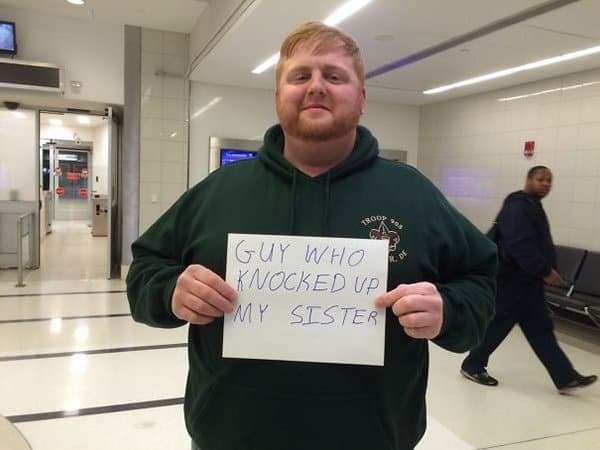 You can’t always gets smiles and hugs at the airport, sometimes you get mildly threatening signs like this one that reads, “guy who knocked up my sister.” We are guessing that when the guy in question showed up, he turned around and walked right back onto that plane. What an introduction! We can’t even imagine a husband being away from his wife while she gave birth but sadly, this is the case for many soldiers who don’t get to meet their kids until they return home from overseas. We wish we could have seen the look on this father’s face when he arrived at the airport and held his daughter for the first time. Some moments are just priceless to put into words. Who needs a sign when you have an adorable face like that? 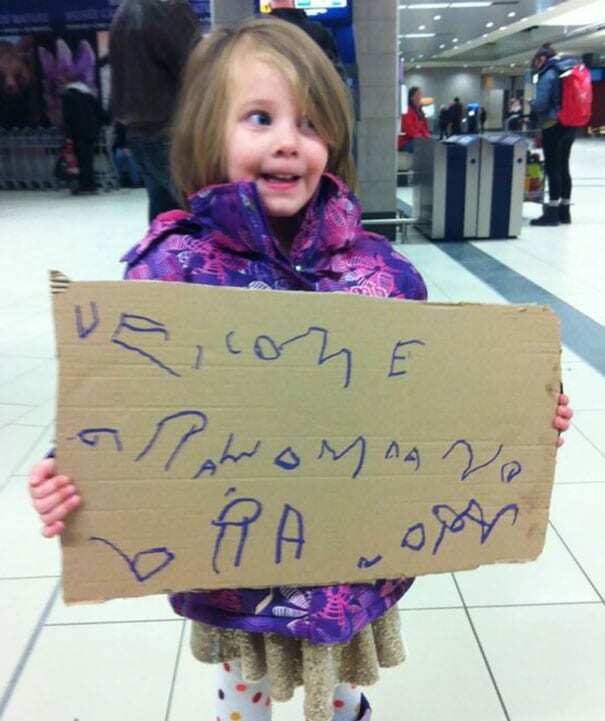 We don’t exactly know who this little girl is welcoming home since we can’t read it but it’s the thought that counts right? Even if her sign did not come out the way she wanted it to, this cutie looks proud to be holding up her masterpiece and waiting to welcome whoever it is she’s there for, home. Who knows, maybe she’ll grow up to be an artist or a writer. This guy knows how to make people laugh. We bet there is a lot of sibling rivalry between this guy and his sister who he clearly thought would not make it through her trip abroad. “Oh great, you somehow survived,” isn’t the most welcoming or encouraging message but at least she arrived home safely to read it. However, it’s all in good fun as the sister seems to be able to take a joke even if it’s at her expense. 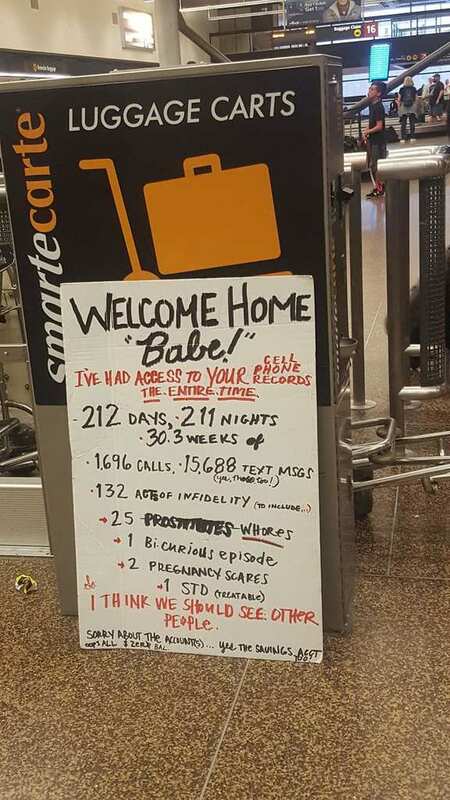 We bet this guy was really looking forward to hugging his girlfriend at the airport after returning from a 212 day trip but he must have been stunned to see a break up message instead that exposed him as a cheater. 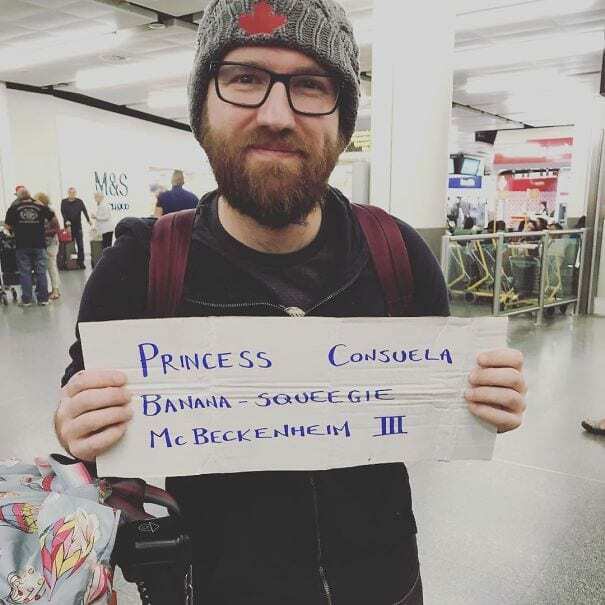 Maybe that is why no one is waiting to pick this guy up in arrivals and he was greeted by a sign instead. It sounds like this guy went on quite the interesting trip. We’re not really sure how to feel about this one. 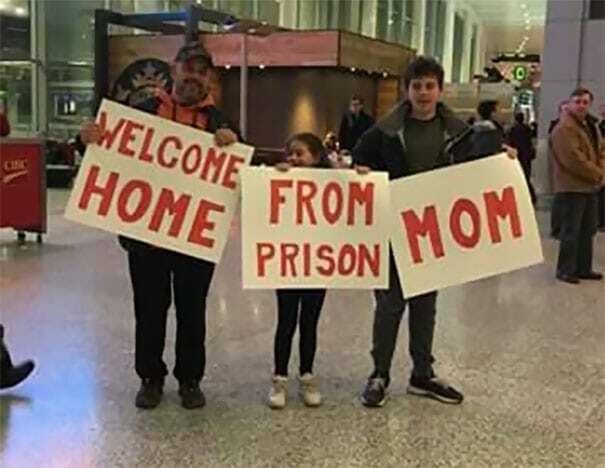 Although we think it is cute that these kids put in the time and effort to welcome their mom home from a trip, (and presumably not from prison since their standing in an airport) we might have suggested that they come up with another joke that didn’t embarrass her quite as much. We hope that this mom could take the joke and didn’t totally freak out in front of her family. Little baby Kaden looks overjoyed to be reuniting with his dad after a long time away. And mommy seems happy too. Now that he is home, this dad can expect to do a lot of diaper changes to make up for all of the time that he missed. But we’re sure he won’t mind since he gets to spend time with his son who is just to cutest baby. At least the woman who made this sign will get a couple days off from her mom duties. Most people get excited at the thought of picking their loved one up at the airport after not seeing them for so long. We’re guessing that this girl’s sister takes a lot of trips and she gets stuck picking her every time. The airport must be really far away from their house because this sign maker doesn’t look too happy about driving their so frequently. How many welcome homes signs has this girl written that she got so frustrated that it came to this? Is you! 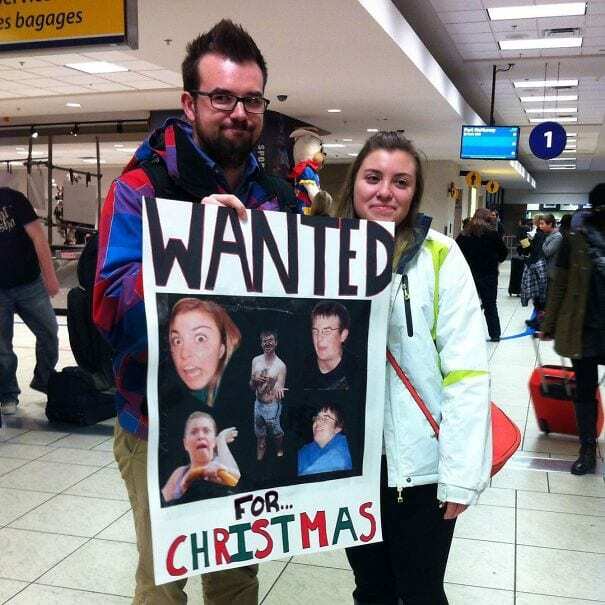 These two do not look very excited that their family made this giant sign complete with embarrassing pictures of them for all of the airport (and now the internet) to see. No wonder so many people hate coming home for the holidays. But we bet these kids aren’t too mad at their parents and their family seems like they know how to laugh and have a good time. We can only imagine the jokes that were told at their Christmas dinner. This sign could not have been made by anyone besides an annoying older brother. Ever hear the saying, ‘distance makes the heart grow fonder’? Not for this guy! He clearly enjoyed all the attention he was getting from his family with his sister away in California. But we know that deep, deep down, he loves his sister and wants the best for her just like every other brother. Love works in mysterious ways. You’ve heard of airport marriage proposals but have you heard of bro proposals? 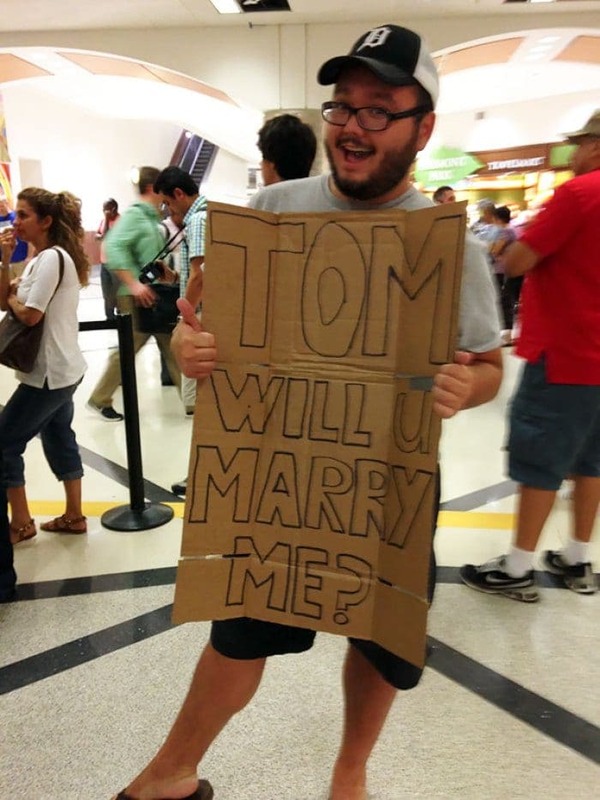 We can’t imagine the look on the guy’s face behind the camera when he showed up to the airport to see his friend holding up a sign asking him for his hand in marriage. Maybe these friends don’t plan on getting betrothed anytime soon but we bet they will be together forever since they seem to have such a strong friendship. We have got to give this guy a huge pat on the back for putting himself out there. 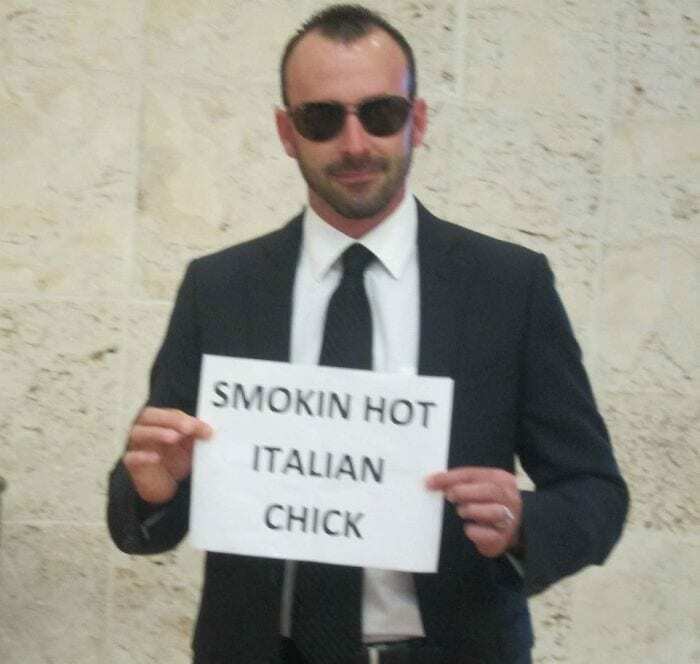 While we don’t believe for a second that this guy got a date with an gorgeous Italian girl, we do think that it takes a lot of confidence to go all the way to the airport and hold up a sign just to find love. From the looks of his expression, we think that this is not the first time that this guy has done something like this. We really cannot wrap our heads around the fact that these three are actually related since they look nothing alike! However, they must be siblings since they have the same weird sense of humor. 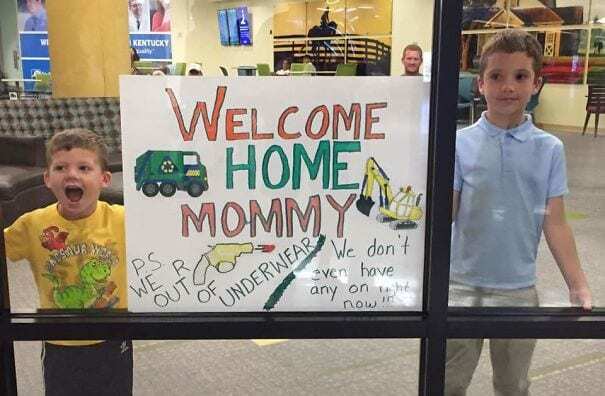 We bet their parents were giggling when they saw their kids walking toward them with this sign at the airport. The sign looks pretty accurate though as the pink hair is definitely sassy. However, we really hope these guys know how to spell orphans correctly. 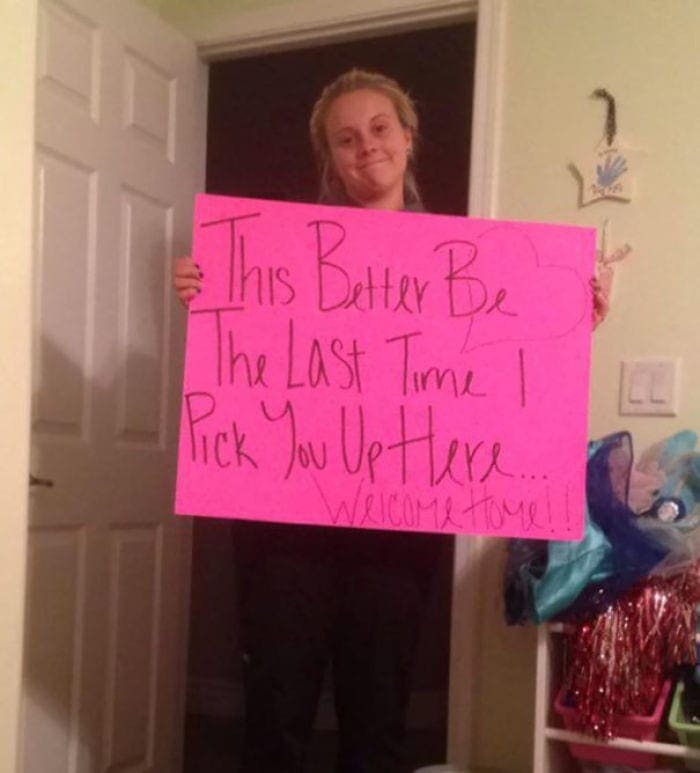 This has to be one of these most creative ways to welcome someone home. While some people love being the center of attention, we’re guessing that this guy was wishing he could run and hide after he saw his friends with a blown-up picture of an embarrassing face at the airport. Just based on this picture, we think that Mokie looks like a fun guy and his has a great name too! 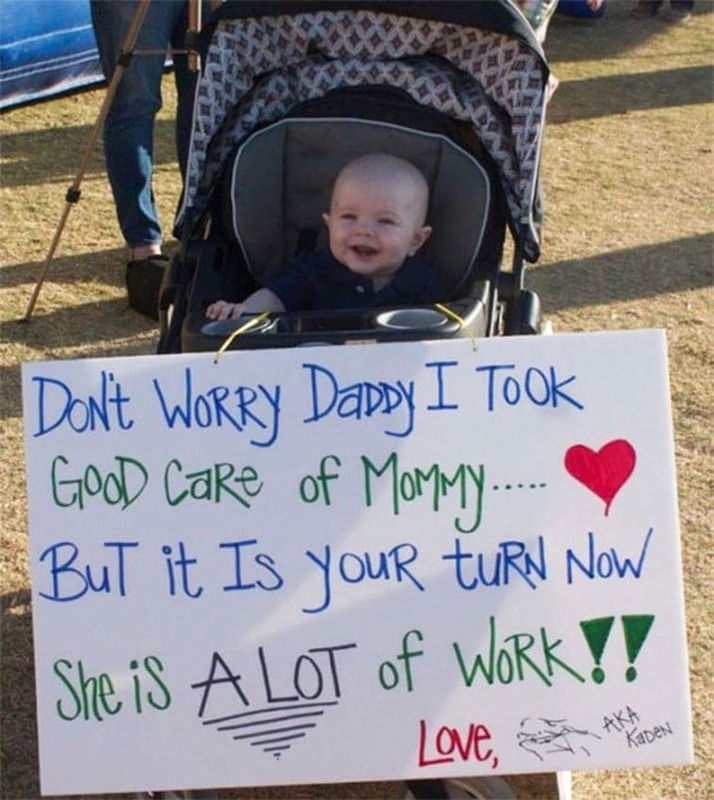 This is one of the sweetest signs that we have ever seen! 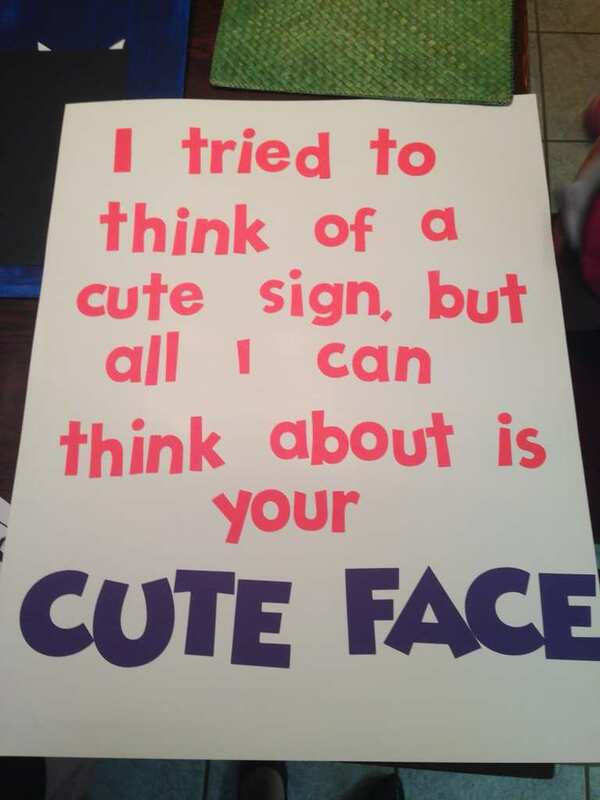 While a silly sign with puns are funny and surprising, a romantic sign like this just makes our hearts melt. This sign maker clearly put a lot of effort into coming up with a unique welcome home sign but they were just too excited. 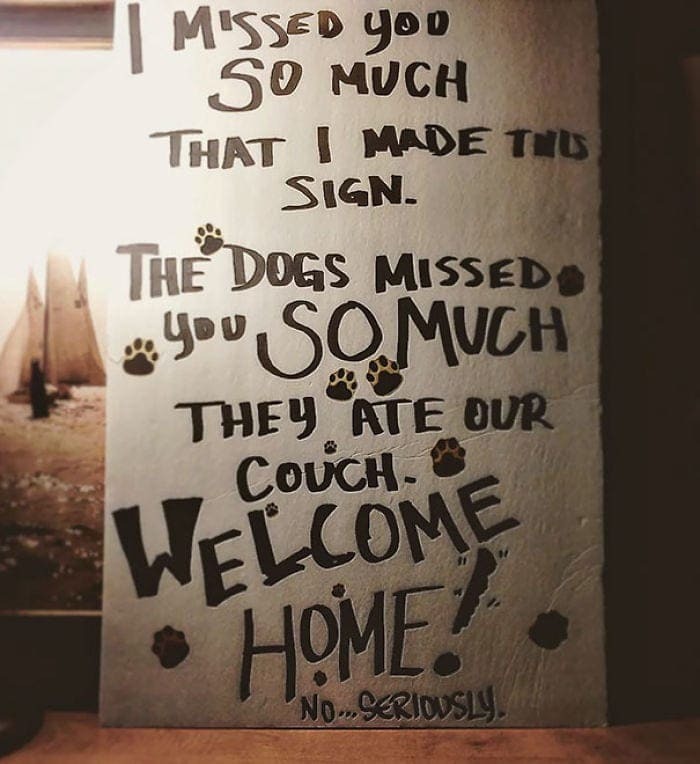 We wish we could see the look on this person’s face when they came home to this incredibly cute sign and a hug from their girlfriend or boyfriend. 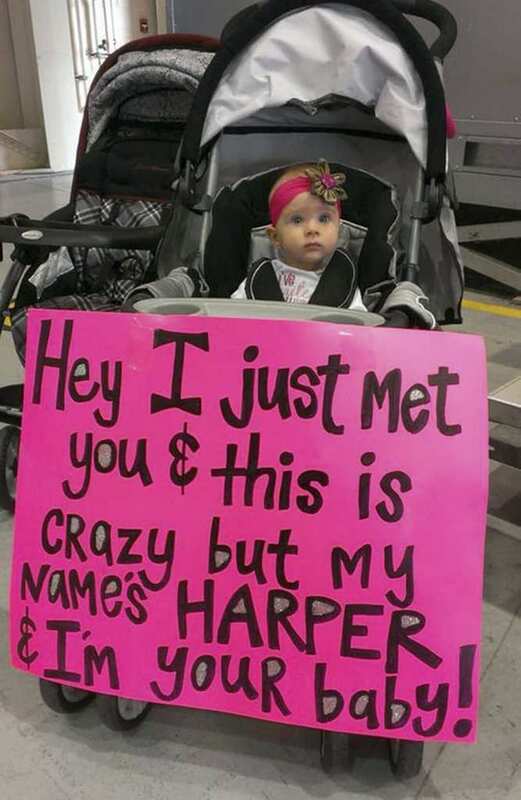 This army wife showed up to the airport with her new baby in toe so he could meet his father for the very first time! This hilarious sign was a great addition but we don’t blame this woman for putting on a little weight since she just had a baby in her belly and we’re sure her husband won’t care one little bit about her size! After not seeing his wife and newborn baby for so long, we bet all this soldier wanted to do was hug them and never let them go. 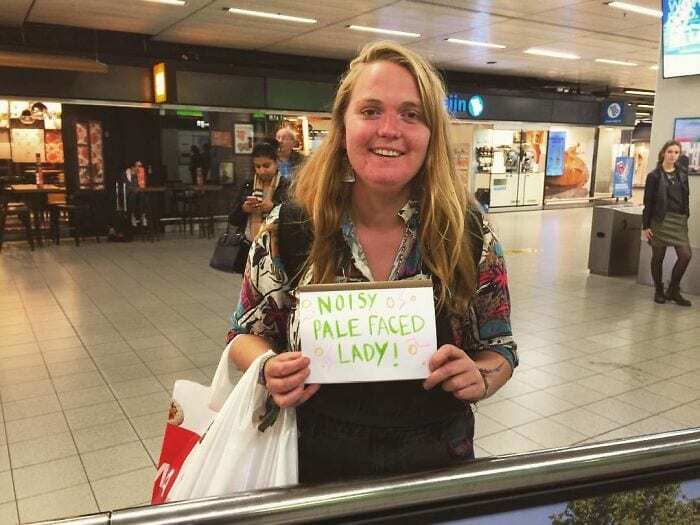 We really hope that the “noisy pale-faced lady” that this girl is picking up has a good sense of humor. 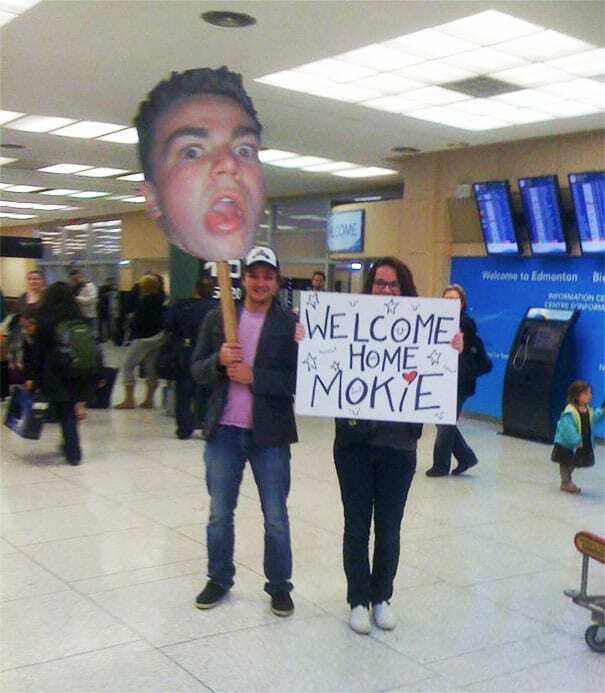 We are realizing that picking up your friends and family at the airport is a great way to express your creativity and this is one of the most creative signs we have yet to see. This noisy lady might be trying to enact some changes in her life after realizing that this is what other people think about her. Maybe she was waiting for a guy named Gravy who happens to be very attractive? This woman who is holding up a sign for “hot Gravy” is either picking up someone with a very odd last name or she did not realize that she was at an airport and not a restaurant that serves Thanksgiving food. Although we are laughing now, we can bet that there were some awful consequences as a result of this very puzzling sign. This is both heartbreaking and uplifting at the same time. This girlfriend or wife has been waiting many months to welcome the love of her life back home from his deployment in Afghanistan and we couldn’t be happier for her that the wait is finally over! 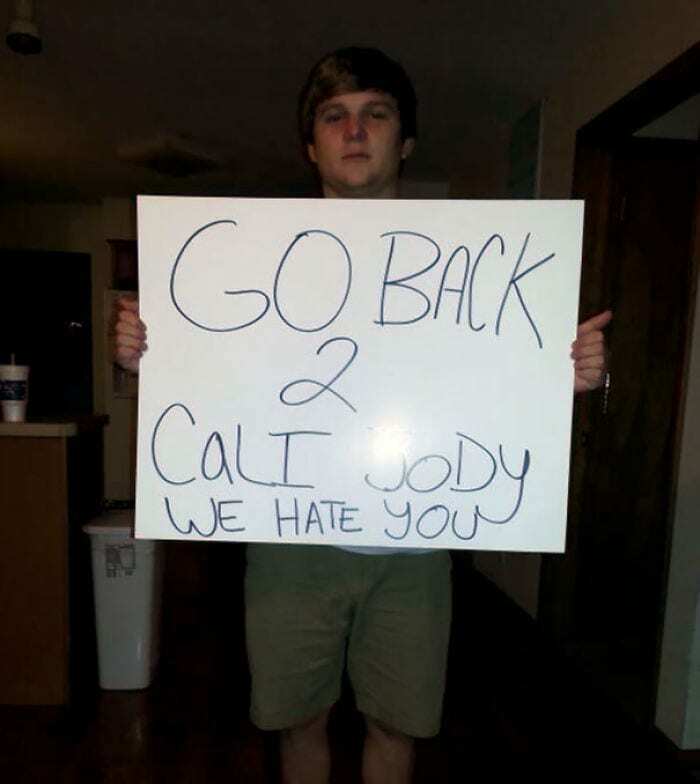 We wish we could have seen the emotional reunion that this likely was in person but this sign will just have to do. This southern belle probably dropped that sign the second she saw her partner so she could run into his arms. Who thinks that this is an adorable sign? That guy! This deserves an award for the most creative sign that we have seen thus far. 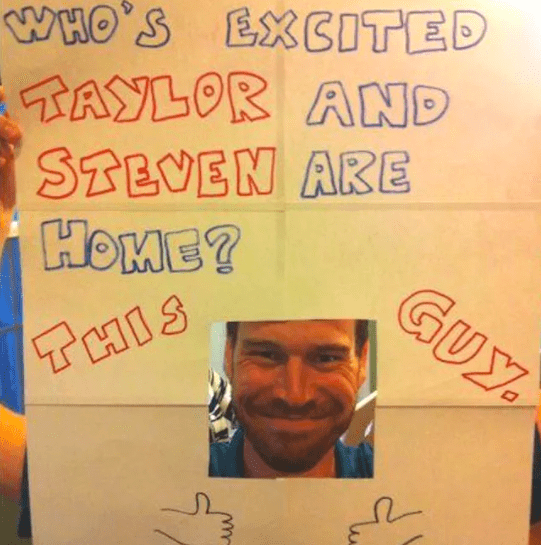 Steven and Taylor have some dedicated and loving friends and they are super excited to have them home. This sign isn’t just funny, it’s actually really thoughtful that these friends went to all of this trouble to show their buddies how much they mean to them. We give this sign and Steven and Taylor two thumbs up! It’s worth a shot. This woman was clearly making a joke when she went to go pick up her two friends at the airport but you never know, maybe she got a couple numbers after she held this beautiful sign up. We know she definitely got some strangers coming up to her telling her that she found what she was looking for. However, we don’t really think that anyone can be ‘hot’ when they have been flying in sweatpants for 15 hours. What things do all billionaires have in common?